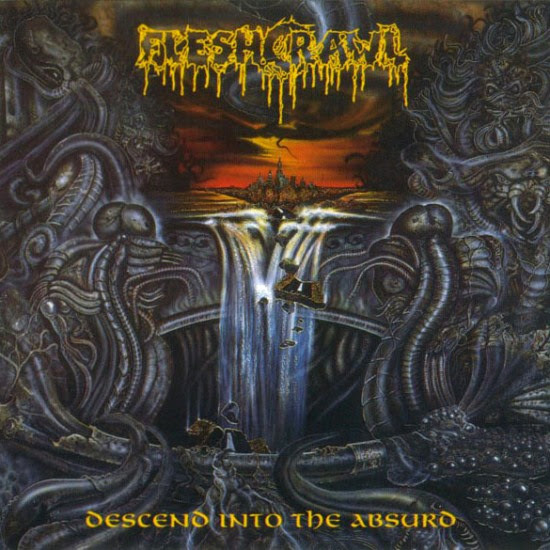 Influenced by Autopsy in both name and timbre, Fleshcrawl eschewed for the most part the necrolibidinal obsessions of that fine band to create a relentlessly dark and epic brand of death metal. At high volumes, on a good music system, in a closed environment, perhaps in a state of intoxication which has lasted through the night till the break of dawn, with friends gathered and banging in unison as a prelude to a long-awaited concert, Descend into the Absurd creates a dense swirl of atmosphere rivaled by few death metal bands. From small acorns grow mighty oaks; Descend into the Absurd is near-innocuous on first encounter. For 1992, when death metal had already captured the peak of its technical and compositional potential, this must have seemed positively anachronistic. But Fleshcrawl, like their mentors in Autopsy, worked a different schedule. Theirs was a death metal less of ostentatious activity and more of suggestion; of identity created through blocks of slow-moving power chords and deliberately-plucked single note melodies; of percussion occupying the crevices between this lumbering motion, becoming something more than mere accompaniment, in its free-ranging expression elevating rhythm as a palpably physical abstraction unconforming of contrivances like “style”, even approaching something of the melodic character existentially denied to the phenomena of rhythm itself. Despite its simplicity, or perhaps because of it, Descend into the Absurd represents an ultimate flowering of the dark subconscious aspect of death metal. A guitar tone like Leatherface’s chainsaw slicing through flushed teen flesh introduces Dark Recollections. And just like slasher movie varmints and the psychological demons they figuratively represent on screen, it never lets up. As hallowed as the Carnage pedigree was, even the classic Entombed and Dismember debuts had their share of accessible moments (hear the legendary Phantasm-outro on ‘Left Hand Path‘ the song or the equally unforgettable intro guitar solo to ‘Dismembered‘). But Dark Recollections has literally no instances of levity. It hounds and it haunts like some presence trapped between dimensions. Everything from the classic cover art to the music screams the stuff of deadly nightmare, and it is precisely this unforgiving nature that makes it the grittiest death metal album to have come from Sweden. Reams have been written about the Swedish death metal sound. While Dark Recollections retains the punk predilections of that strain, it is never “bouncy” or effervescent in the way the scene was far too often prone to be. Carnage went one step farther, and adopted the song-setting ethos of grindcore classics like Scum and F.E.T.O., while transplanting a drumming style somewhat more ambitious than the D-beat-happy aesthetic of the times. The hybrid automatically creates a loop of mutual reinforcement, resulting in more progressive structures than were the norm. Progressive is naturally a relative term to use in context with Swedish death metal. Dark Recollections will never be the torch-bearer for internal riff development in the manner of a Morbid Angel or an Immolation. But what it loses in the way of internal motion, it more than makes up with acute spatiotemporal awareness and sheer sonic violence. This is a music of bruising increments, workmanlike in assembly with nearly no egregiously distinguishing facets, but which in the eventual accounting of scales encapsulates nearly everything we imagine death metal to be. If Descend into the Absurd is the pre-gig ritual, then Dark Recollections is the gig itself. The former gets one in the mood, the latter is the very embodiment of the hessian ideal. Knuckles raw, ankles sprained, and all bets off, Dark Recollections goes through. 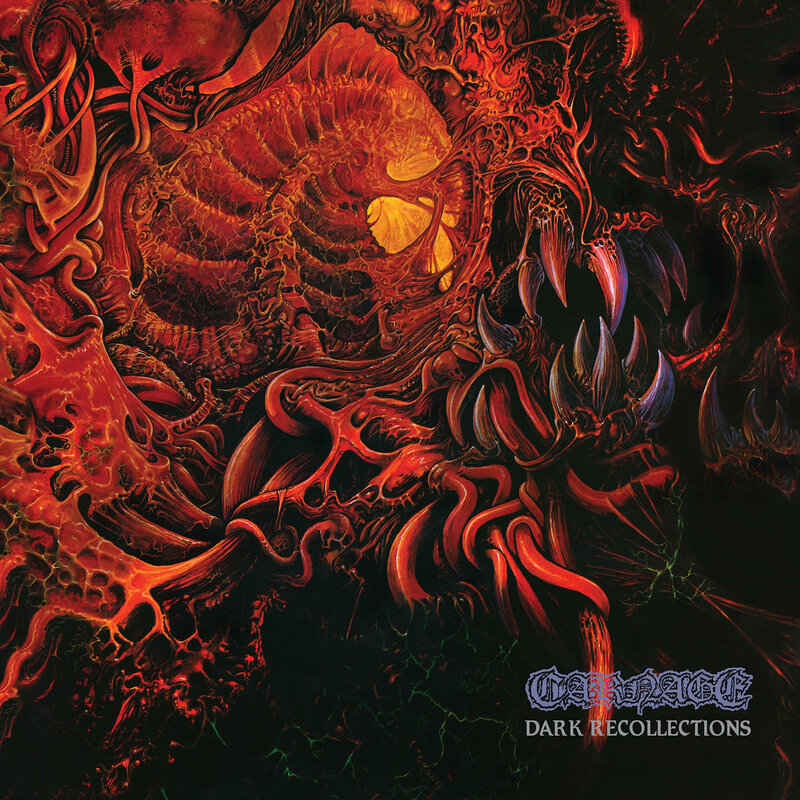 This entry was posted in Death Metal, Death Metal Battle Royale and tagged carnage, dark recollections, death metal battle royale round 1, descend into the absurd, fleshcrawl. Bookmark the permalink.